The special edition Rainbow Sunset Stacking Tunnel, with the colors reversed to reflect the evening sky, is hand crafted by Germany’s Grimm's Spiel & Holz toymakers. It’s a beautiful and versatile toy that offers endless opportunities for creative play — it can be used as a tunnel, a ball run, a doll house, a bridge, an animal pen — anything your child's imagination can dream up. Children of all ages (and adults!) will treasure this lovely, heirloom-quality piece for years to come. The 10-piece rainbow is cut by hand, arch for arch, from a single block of wood and hand-colored using safe and natural water-based stains to allow the wood grain to shine through. Unique knots and individual markings are part of the natural beauty of the wood and a hallmark of Grimm's wooden toys. 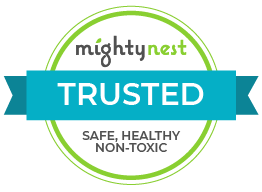 Tested and certified to be non-toxic and safe for children and babies. Grimm's Spiel and Holz's intent is to develop long-lasting toys, whose simple shape together with its beautiful coloring and inviting surface can be used for all ages. Grimm's makes products that will last for generations and will be played with, again and again and which communicate their credo: Joy through color. All of their dyes are water based and in accordance with EN 71 harmless to your health and suitable for children toys. The same is true for the natural oil used. Grimm's is committed to helping children discover and develop their own creativity. CPSIA compliant.